Webbed Hand welcomes the work of Marco Lucchi, a noted and very skilled musician who has distinguished himself in Europe for his work in the experimental, new age, and electronica genres. This album is the audio document of a multimedia performance which took place in 1999, based around the texts of French poet Jean Michel Maulpoix, who took part in this event. The music was composed and performed by Marco Lucchi, with the accompaniment of other musicians and vocalists. The performance was a very visual event too, with dance, lights, and projections. “Alassandra Dallari – although you cannot see or hear her – was the mudra – the mudra symbolizes the motive of desire as it is intended in the tantra contemplation… you can imagine an almost acousmatic performance… Alessandra appeared in the middle of the multimedia performance wrapped in a long plastic sheet that she unwrapped along a ten minute slow dance while wrapping the audience with it… at the end of the unwrapping she remained for a second completely naked, just for a second, in a dark blue light. “The [spoken] words are taken from the book by Jean Michel Maulpoix titled Precis de theologie a l’usage des anges [publ. Editions Fata Morgana, 1988] that is a poem in prose with a very reflective and philosophical flavor. The book talks about angels in a very modern – although poetic and evocative – way. Est la chance d’un fruit mur! and recorded samples of buddhist chants. 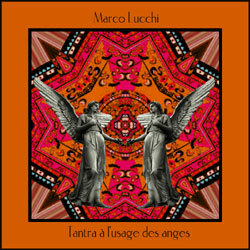 This entry was posted in Catalog and tagged Catalog, Experimental, Marco Lucchi, Releases by C.P. McDill. Bookmark the permalink.